This High Precision Spindle has provision to Auto Clamp ISO 10, type tool holder , RPM range is 30000 to 60000 as they are mounted on ceramic ball bearings, and power is 2.2 Kw, These spindles are used in CNC fully automatic Machines. 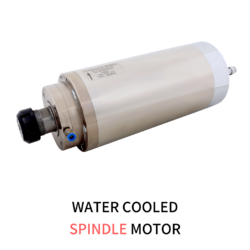 Spindles have capability of feedback system. They are dynamically balanced with G0.4 Grade to ensure no vibration on spindle. Due to our huge proficiency and knowledge in the market, we are highly involved in providing Aluminum Spindles. These offered products are manufactured and developed using premium quality factory inputs and contemporary tools. Apart from this, these offered products are available in varied designs, sizes and stipulations. 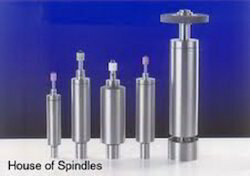 Backed by experts and experienced professionals, we are involved in offering Precision Spindle. Manufacturers of Precision Spindle Assemblies for Turning Centers, Machining Centers, Grinding Machine, Milling Machines, Boring Machine, Tapping & Drilling Machines and SPM's. We can offer you both Belt Driven & H.F Motorised Spindles at very competitive rates deliveries. Spindles ate used a device tor power transmission and are placed between Couplings. Spindles are manufactured out of forged steel, basically EN-8 or EN-9 and are property machined as per the design and requirement.